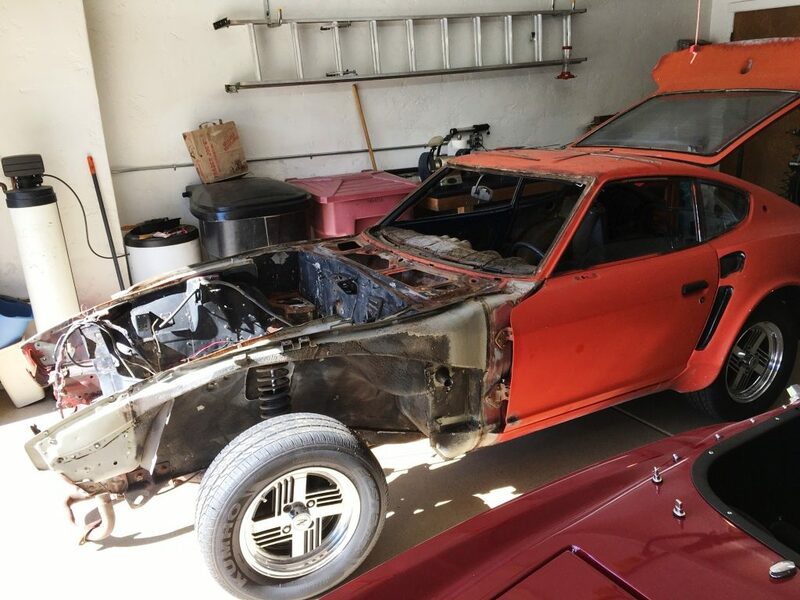 I had decided to have my favorite local shop do the body work and paint the car – they’ve done work on several of my other Datsuns. Before long, they were at my house to look at the car, assess the amount of work needed and give me a rough estimate. We were both hoping at that point to avoid removing all the bonded fiberglass pieces. Wanting to save as much money as possible, I asked what I could do to prepare the car in advance of him receiving it. He asked me to strip everything off the car, leaving only a rolling shell. He also requested I hand sand the engine bay to prepare it for primer. I knew the car had come into Alan’s father’s body shop for a repair, likely as result of an accident. In the process of stripping the car I noticed the passenger door was a different color than the rest of the car, which was my first clue. My second clue came when I pulled off the hard plastic welting around the passenger door opening, revealing what appeared to be a replaced rear quarter panel that had been poorly “pop riveted” in place where a pinch weld should have been. That left me greatly concerned, wondering what we might find under the fiberglass quarter panel. After completing my sanding and disassembly, the car was transported to the body shop in early December 2016. 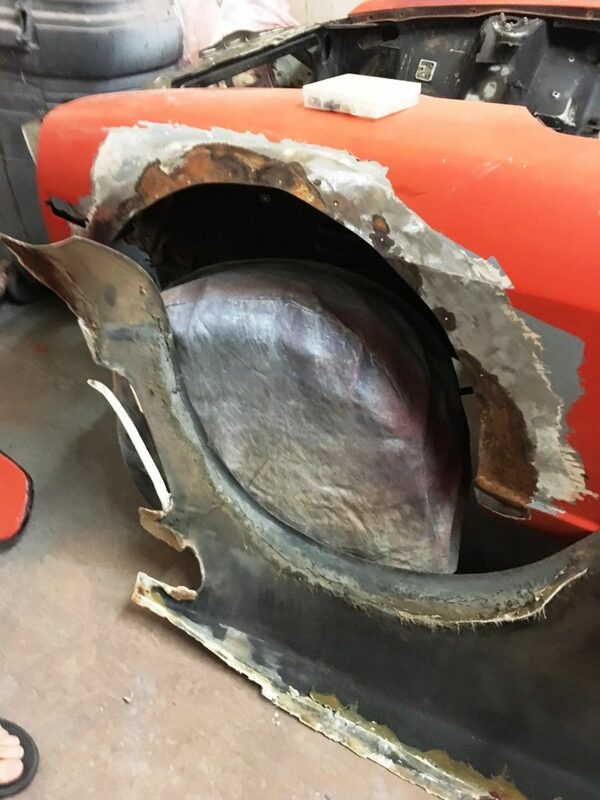 The first order of business, upon arrival at the shop, was removing one of the front fender flares which was cracked and had begun separating from the steel fender. Next the whale-tail rear spoiler was removed because it showed signs of rust beneath it. 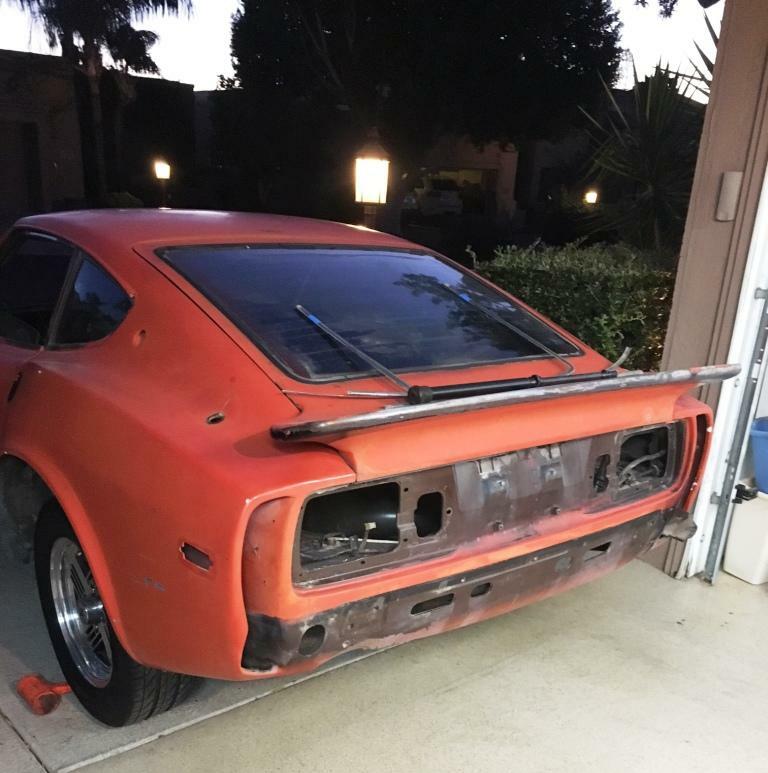 After seeing what was underneath, it was decided we’d replace the fender and hatch due to the rust under the fiberglass. That wasn’t a huge concern, as I had access to replacement panels, both of which could easily be swapped with the rusted panels. We’re on a roll now – Join us for Part 9!